For many of us, antique trunks have a special spot in our hearts. As storage devices, trunks have protected our journals, special baby clothes, and other memories. For others a trunk represents a great adventure, or a new life. Many of these trunks (as shown) were owned by soldiers, and many were brought over the Atlantic as war brides moved to be with their North American husbands. Once trunks had fulfilled their original purpose they were often relegated to basements where they were exposed to mice, insects, and water damage. Rather than having them restored, many owners opted to throw them out which is a shame because most trunks can be salvaged and become useful again. The picture above shows the condition of a trunk as it was brought to me. One of the most important things to remember when restoring a trunk is to do it in such a way that it still looks like an antique trunk. I have seen the results of over-zealous painting and cleaning and it ruins the value and spirit of the trunk. trunk after restoration. Note that it still looks old. Clean trunk thoroughly using ammonia and soap dissolved in warm water to remove grease and grime. Use a soft brush where necessary but do not keep the trunk wet longer than necessary. Rinse by wiping with water and vinegar and buff dry. Let dry overnight. Sand the metal and anything else that requires smoothing but do not sand leather. Wipe off dust. Paint metal strips and leather straps (only if they have already been painted otherwise you would use shoe polish in the colour of the leather). Let dry overnight. Paint the body of the trunk very carefully using the best brushes for the job. 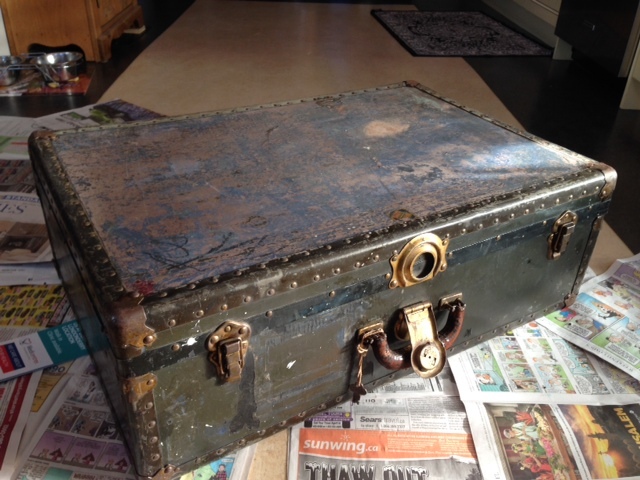 This trunk was originally an “army” green so I matched the colour and used a water-based paint. Let dry overnight. I mixed two colours of metallic gold and painted thin, slightly uneven coats of paint on the metal corners, lock and latches. It is important to keep this thin so that it does not easily chip off. I hand-painted all the rivets with the same paint. Finally I antiqued the trunk by putting a thin coat of tinted Deft oil over the areas painted with green paint and blotting gently with a cloth using a ragging technique. This helps to seal and soften the look of the newly paint surfaces. Let dry at least 72 hours, longer if there is high humidity. Although restoring this trunk took a bit of patience, it was not difficult to do. As the owner said “This trunk is bound to out-live me,” and I had to agree. I found your post when doing some research on restoring trunks. I found one that so much like this one. My concern and my hopes that you can help me i am worried that it might be a older reproduction. The hardware seems to be in very good shape. I can not find a makers mark anywhere and the outside seems to be covered in a black thick paper. Some of it it has torn revealing a thin wood beneath. I would love to know what the outside have originally had on it. It there anyway to tell? Hattie: Occasionally you can come up with trunks that are in pretty good condition but this generally means that the people who owned the trunk didn’t travel much. Many trunks are found in both Canada and the US because so many people immigrated here and brought their most precious items in tough trunks. Most got damaged in transport. Their subsequent storage makes a difference as well. If the trunk was kept in a dry place, with no exposure to water or high humidity then the hardware would not look rusted or pitted. I can’t say for sure because I can’t see your trunk, but yes, some trunks (less expensive types) were made of thin slabs of wood covered by heavy craft paper (on the outside) which was then painted. The interiors were covered with wallpaper so the wood was essentially “sandwiched” between the two. Given the above, it is entirely possible that the trunk you speak of is indeed an older one. How can I find out how to finish the metal on a trunk the way it was originaly? Given that metal finishes were applied at the manufacturers you wouldn’t be able to do this yourself. You can bring your pieces to a metal plater and they can do it for you or you can create a faux finish that looks like the antiqued finish. I just got a trunk that looks exactly like this! I can’t wait to restore it. One of the leather straps was broken on the sides. Any advise on fixing the leather? Kelly: You can purchase replacement straps online through suppliers such as Vandykes. Simply google “leather straps for antique trunks” and you will see what I mean.Good luck! I found this restoration guide also. They have tons of information about trunk and refinishing. What is this trunk made of? Most trunks contain a variety of materials so the techniques for sprucing them up changes with the materials and the finish that was applied to the original surface. 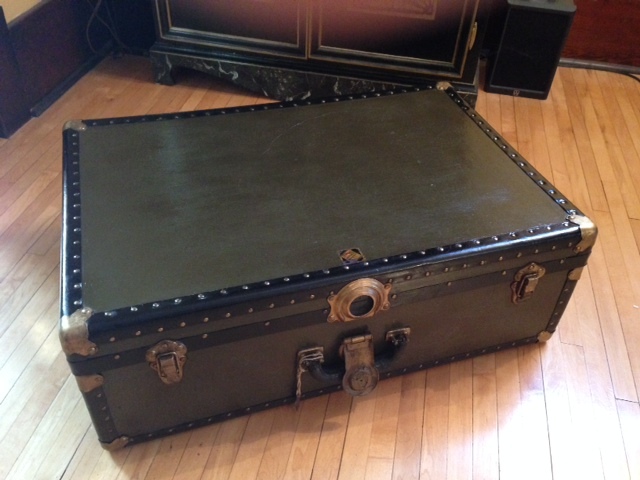 This trunk has edges made of leather strips, metal strapping and fabric-covered wood. Yes the smell of grease or oil can be quite powerful. Make sure that the paper that you use to line your trunk is made of plastic – not paper. 100% vinyl is best as it will not allow the oil or smell to permeate whereas paper will. Your books will absorb the smell as well because they are made of paper so you might want to put less valuable books on display if the smell is indeed strong.I commend you for giving your old trunk a new lease on life in this way. Thanks for the post. Thank you for making this post. I’ve been looking for a tutorial like this for a long time. My grandpa’s little army trunk is all warped from being under the house, and from my research I gathered it is made of cardboard? What is this one made of? Yes, some trunks were made of cardboard that was reinforced by leather or metal edging. This one was a suitcase-style trunk and was meant to be picked up by hand so the wood is quite thin. More substantial trunks were made of wood slats, metal and leather but those were primarily meant to be transported by boat, plane or rail (not to mention horse and buggy).If your grandpa’s trunk is warped from getting wet there isn’t a lot you can do except replace the warped parts which may not be too easy.